You are here: Home / Blog / scissor skills / Color Cut Glue Shark Freebie – Just in Time for Shark Week! 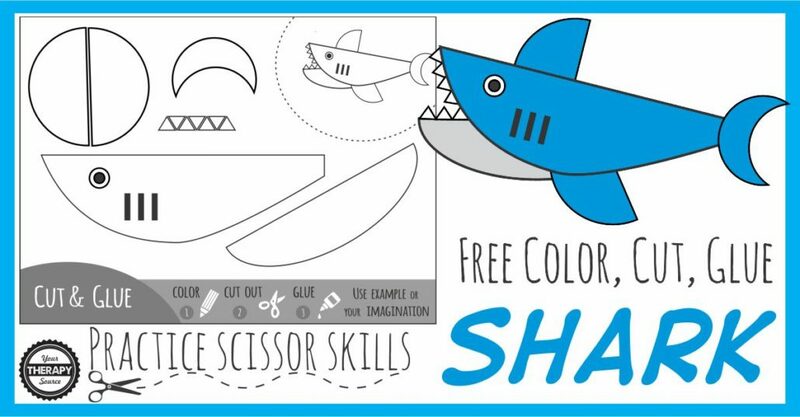 Color Cut Glue Shark Freebie – Just in Time for Shark Week! All right, I admit it… I definitely get sucked into the whole shark week thing. And super ashamed to say that I will be tuning into to see if Michael Phelps beats the shark. It is all such ridiculous and mindless television but I do enjoy to zone out once in awhile. Last night, I decided since everyone LOVED the free Spring and Summer Color Cut and Glue projects why not create a shark. Download your free copy at the end of the post. This is a simple one page black and white activity to practice coloring, cutting out simple shapes, planning out where to glue the pieces (the trickiest part) and then paste the shapes together to create the shark. Just print and it is all set to go. So look at that – all in the name of Shark Week and you can have fun practicing those skills. Haha! Remember to get your free copy by signing up for our newsletter at the bottom of the post. If you need more specific information on the development of scissor skills, check out The Scissor Skills Book. This digital download is a huge resource for anyone who works on scissor skills with children. Written by the Functional Skills for Kids (FSFK) team of 10 pediatric physical and occupational therapists with years of experience in the field, The Scissor Skills Book is the ultimate resource for tips, strategies, suggestions, and information to support scissor skill development in children. Sign up to receive the weekly newsletter and other announcements from Your Therapy Source. You will be redirected to the shark freebie.